I’m not sure why people are surprised when they learn my two-year-old, Petra is vegetarian. I am, and have been healthily and happily so for nearly twenty years. But there’s something about babies that makes the meat-free diet a curiosity and, sometimes, a cause for concern from other mamas (I’ve been asked “where does she get her protein?” or “what about iron?” more than a few times). In my household, vegetarianism is the norm and my doctor would attest that it works great for my family, but it’s definitely not a lifestyle you and your baby should jump into without being armed with some real knowledge of what bodies need to be healthy. I’ve had two decades to learn how to be a well-nourished vegetarian and now, I’m glad to have my baby along for the ride. There are a few types of vegetarians so it’s important to note that Petra and I are ovo-lacto vegetarians, meaning we don’t eat meat but we do eat free-range eggs, milk, honey, and other animal products that are harvested peacefully. Already, this means protein is an easy get for us since eggs, Greek yogurt, cottage cheese, nuts, and milk are excellent sources of protein at home and when we go out, there are tofu or tempeh meat substitutes available at our favourite restaurants. Because Petra skipped pablum and purees and instead ate whatever we were eating in a chew-first, learn-to-swallow-second method called Baby Led Weaning, I knew that if I was getting a good amount of protein, she was too. It was iron that took a little more thought. My heart goes out to parents of kiddos with nut allergies because wow, did I rely on nut butters of every sort when my girl was going through a phase of refusing to eat anything but ‘spreads’ on crackers (hummus was also my friend that week). Generally, though, Petra so enjoys the high-iron foods we have on hand so much, she asks for many of them as snacks. Frozen peas and snap peas top her list and because they have vitamin C in them as well, the iron is easily absorbed, a secret of iron that even I didn’t know until I was doing some googling in preparation for Petra’s intro to solid foods. And although we didn’t make iron-fortified infant cereal in the traditional sense, I’ve often used it to bake banana-sweetened cookies and granola bars. 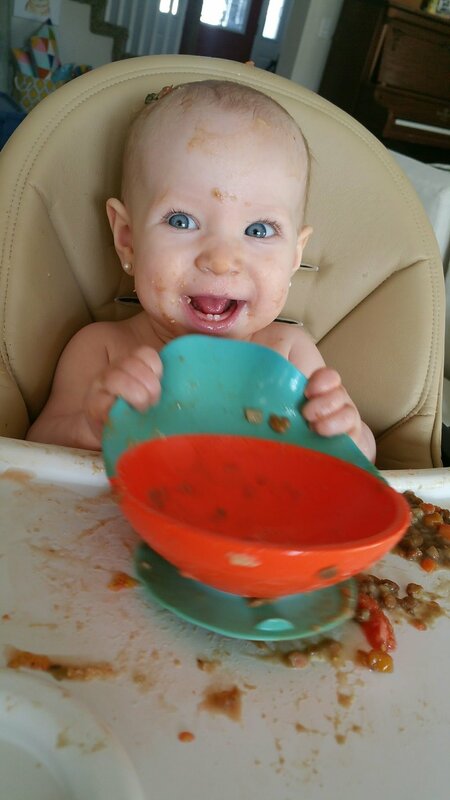 Other high-iron foods we love include lentils (pictured... it's a mess at six months but she loved 'em!!) and quinoa (both of which I made into fritters or veggie burgers until Petra got the hang of using utensils), nuts and nutbutters, seeds and seed butters, beans, and dark green veggies like kale and broccoli. A great cheat for making dark leafy greens manageable for toothless wonders like Petra is to just pop them into the blender alongside the ingredients of your favourite pesto recipe. Bonus: it’s truly delicious. I’m not sure if Petra will always be vegetarian because, of course, I am not her; as is, she eats a wide variety of global cuisines and nearly keeps up to my serving sizes so it’s safe to say she’s enjoying her culinary offerings. It has come up in books that a character eats chicken and Petra has spoken up that she doesn’t, so she’s not ignorant to her diet being different, but what I love about the food we eat is that I can tell her exactly where everything comes from and we’re both comfortable with it. As a parent, especially one raising a daughter in a world that seems obsessed with body image, it’s important that I model a healthy relationship with food, and for me that begins with being vegetarian. -Protein-rich hummus is easy to make and can be varied by adding different beans, tahini (sesame seed butter), or roasting the garlic for a milder flavour. Google “hummus recipes”, whip some up, and let your baby enjoy dipping spears of cucumber, red pepper, and multigrain naan bread. -Stir chia seeds and flax seed oil into Greek yogurt (letting it sit for a few minutes to soften the chia) for a snack rich in Omega fats, antioxidants, and protein. Fresh or frozen berries, banana slices, or seeds can serve to change the texture up. -Keep soybeans, green beans, peas, and Brussels sprouts in your freezer for high-iron, steamable sides. -Nutritional Yeast on popcorn is a GODSEND. We have a spray bottle of pickle juice in the fridge to help it stick without butter and Petra is obsessed with this 'seasoning' combo. I've yet to try my friends Kelly and Desiree's recipes for cheesy pasta made with nutritional yeast but when I do, I'll blog it! 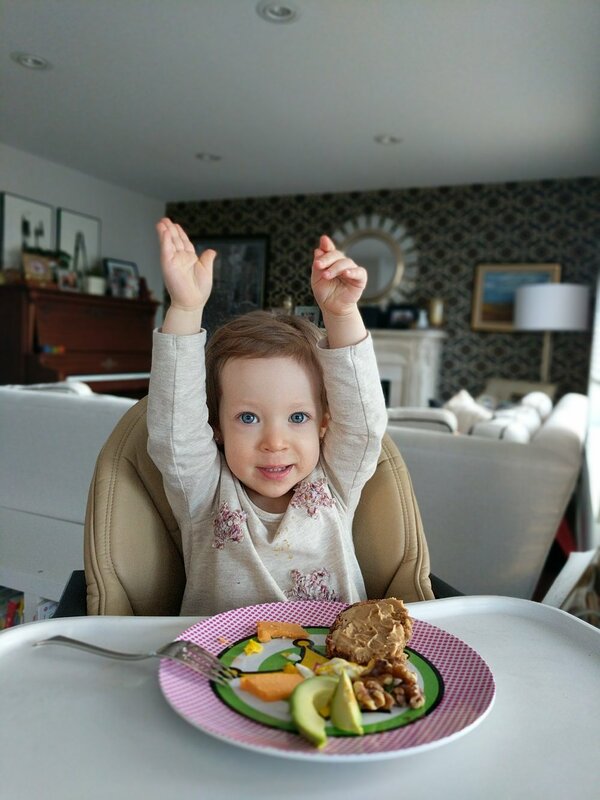 I'd love to hear your toddler's favourite vegetarian dishes or your own personal fave veggie recipe (especially if it's quick to make) so fyi your helpful comments will get put to use.